E-book from Cheeky Frawg out at the end of the year or beginning of next year. You have my blessings for the .pdf you made of my site—thanks very much! I now have the first item on my 2013 Christmas list. Start your reindeer. 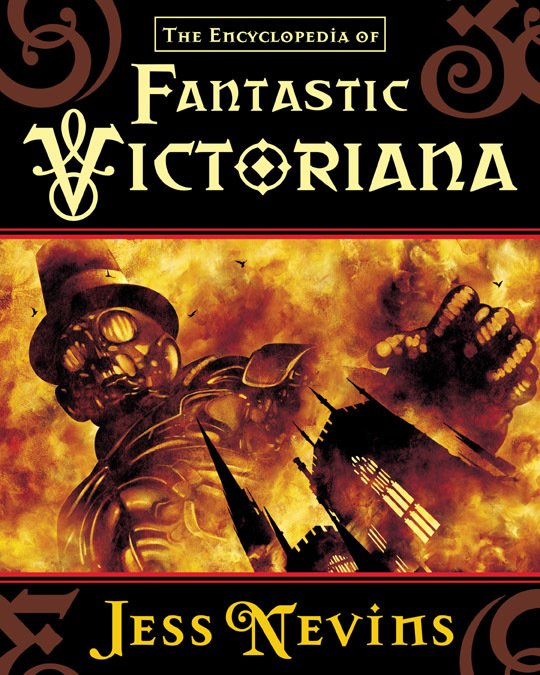 This post contains the closest thing I fear we’ll ever get to an ebook edition of the Encyclopedia of Fantastic Victoriana, the essential reference book for steampunks and anyone who loves real Victorian science fiction, fantasy, and horror — meaning work by Verne, Wells, and that crowd. The EoFV was published in 2005 and now sells on Amazon for roughly ten times its cover price, which this public library copy on my desk tells me was $50. (I just checked again and Amazon prices presently start at $150 used — a steal; someone grab it! — but most copies are in the $400-600 range.) However, before there was an Encyclopedia of Fantastic Victoriana, there was a Fantastic Victoriana website, which had much of the same material in a more informal style. In a sense, the website was the first draft of the book. There are some formatting errors. Some are mine and some are the site’s. I don’t want to hear about them. Hyperlinks don’t work in the PDF. Too bad. Visit the Reocities archive if you want clickable links. Most of the ones in the body text just link to other parts of the book anyway, but there is a substantial appendix with plenty of juicy websites to visit. I guess this might qualify as a bug. I didn’t ask Jess Nevins for permission to make a PDF copy of his website. If he asks me to, I’ll take it down. The founders of Reocities didn’t ask permission either when they saved GeoCities websites by the million. Nevins was one beneficiary, and this PDF is another attempt to rescue some of the best stuff from the ruins. Jess, if you are reading this, thanks for writing the book, feel free to email me, and when are we going to see a new edition, whether e or p? As I write this, Yahoo (I omit the exclamation mark because Yahoo bores me) is acquiring Tumblr for $1.1 billion, a move many are comparing to its 1999 acquisition of GeoCities — an arguably similar virtual community it subsequently neglected for a decade and then literally destroyed. Will the same be said of Tumblr’s 300-million-strong community in ten years? “We promise not to screw it up,” says Yahoo. Really. That’s what they said. I’m betting on the “condemned to repeat it” side of Santayana’s maxim, myself. Before GeoCities was paved over, several teams of digital archivists saved as much as they could, and now there are GeoCities mirrors scattered around the Web. The best of them are Reocities, Geocities.ws, Oocities, and of course, the Internet Archive. I’ve written a script that enables you to search all of them at once when you encounter a broken link to a Geocities site. Just drag the “Dig GeoCities!” bookmarklet (click the link to go get it; that’s not the bookmarklet itself) to your browser’s bookmarks bar (giving it a shorter name if you prefer) and when you try to open a broken GeoCities link, click the bookmarklet while the GeoCities error page is in front. Three more tabs (or windows, if you swing that way) will open to potential mirrors of the page you’re looking for, and the last one will display an Internet Archive link if it can’t find anything. I wrote this bookmarklet because the GeoCities archives have yet to merge their data; sometimes one or two will preserve a page, but not the others, and some are only partial. I was inspired by the Resurrect Pages Firefox add-on, but nothing did quite what I wanted, even the add-on. I would like to see Resurrect Pages incorporate this functionality in future for GeoCities URLs. By the way, this is something I started sketching on paper over a week ago, well before I heard of the Yahoo/Tumblr merger. I’m releasing it under the GNU GPL 3.0 license, so feel free to adapt it for Tumblr when you guys inevitably need something like it up there in 2023. Finally, here are some of my favorite GeoCities URLs for practice. Open each in a new tab/window and click the bookmarklet (on your bookmarks bar) to see the archived versions. EDIT: Although this is quite a simple script, apparently it doesn’t work fully on Chrome because of a known bug introduced by Google in the overzealous pursuit of popup window blocking. I’ll see what I can do. 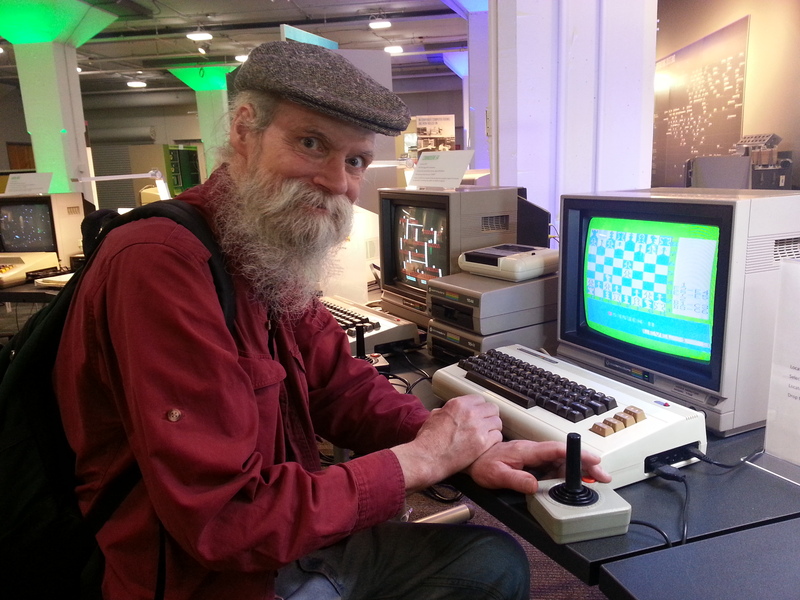 My friend John Braley and I visited Seattle’s Living Computer Museum in early May 2013. The word “living” may seem like hyperbole when applied to the antique computers it houses, but actually, all of them work, and most can be used by visitors. There are computers that play games, and there are others you can program, if you know how. 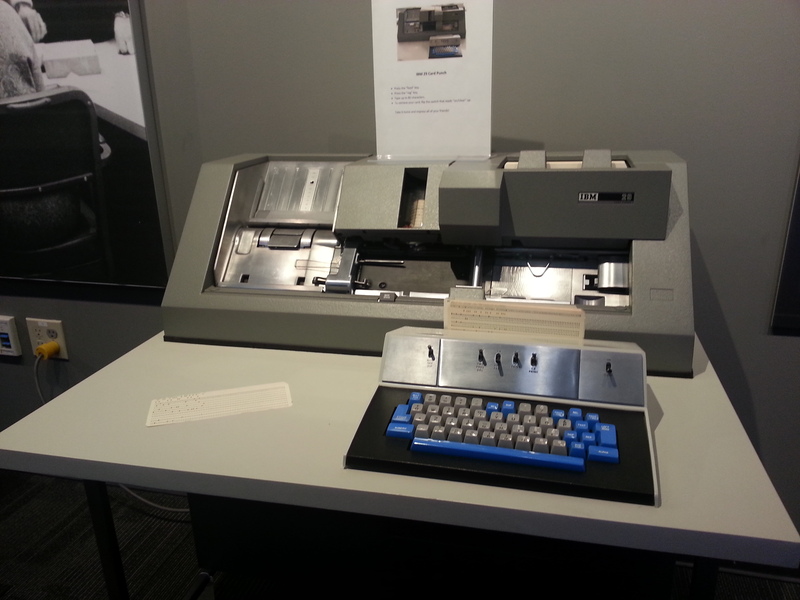 For example, I was able to write a short program for the Altair 8800, arguably the world’s first home computer, and watch it run on a teletype. There are also Mac Pluses just sitting there with boxes of diskettes you can insert, swap and run until you get bored, if you do. I’m going to bring a few of my old Mac floppies next time. If it has a blue rope in front of it, don’t touch it. If it has big, important-looking switches, don’t flip them. These rules were easy to follow and did not feel constrictive. You enter the museum in the gift shop; this is also where you buy tickets. I noticed a few retrocomputing books on the shop shelves that were already on my wishlist, such as one about the Antikythera Mechanism; however, I will probably buy these as ebooks later. Sorry, LCM. 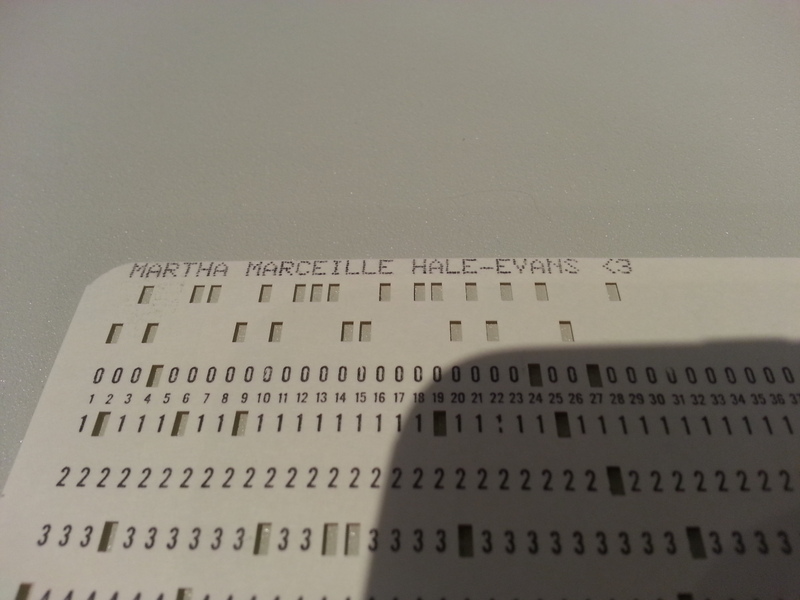 Almost the first thing I did was pounce on the punch card maker and make my wife Marty a card with her name on it and an ASCII heart ❤ — technically a Hollerith code heart, I guess. I was very careful and punched Marty’s card correctly on the first try. Don’t Underestimate Freedom, Sirius Cybernetics Redmond! Moving widdershins through the exhibits, I was surprised by how even-handed the presentation was, given that the Living Computer Museum was established by Paul Allen, co-founder of Microsoft. 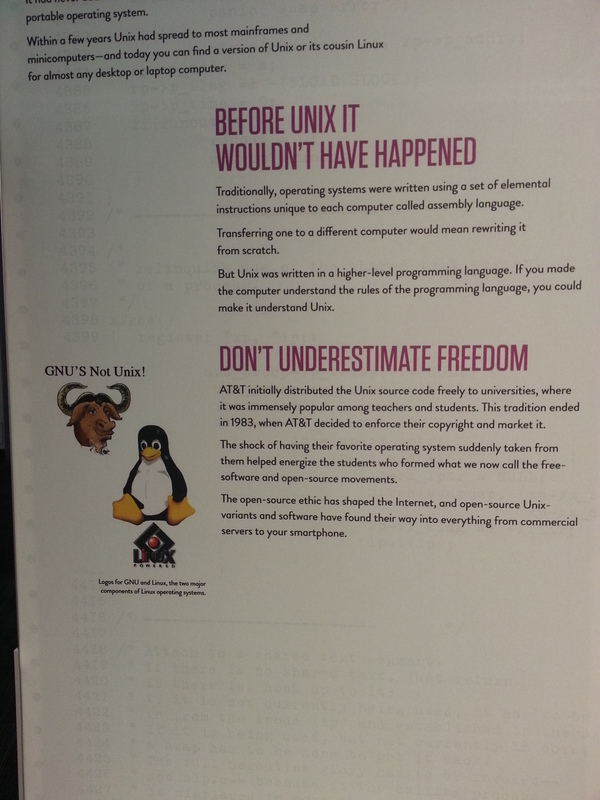 I was actually shocked to see this display, portraying the Linux penguin and GNU gnu. There was another display devoted entirely to Microsoft near the end, but it contained an ignominious instance of Microsoft Bob, among other things. Remember Clippy the talking paper clip? Now imagine an entire operating system interface that’s practically nothing but Clippy, with talking dogs, mice, and so on, all of them Genuine People Personalities™. That’s Bob. I also found that there were elements of virtual reality in Bob, because to reach different controls in the user interface, you have to pretend-walk through the notional house where the dogs and mice live, making it seem a bit like Snow Crash on the cheap, with a dash of Disney. Suddenly a couple of things about my first contract at Microsoft, on the Virtual Worlds research project, came into focus. Me and my Xerox friend, Alto! She remarked that it was nice to have visitors who were so into vintage computers, but she gave us an odd look when John told her that I was so into them, I had bought the model of slide rule used on the Apollo moon missions. I had it with me but refrained from showing it to her — and my loved ones say I have no discretion. John and I vowed we would return to the Living Computer Museum soon. What a great place — and because its displays are themselves programmable computers, each with its own strengths, capable of an indefinite number of programs, you can hardly exhaust it in one trip. So go ye, people of Seattle and West Coast environs, to the Living Computer Museum, and give its staff a reason to move some furniture around and dust off the family antiques. Don’t let the museum staff despair! Even though the LCM is backed by a multibillionaire, if we don’t support it, it won’t be around long. 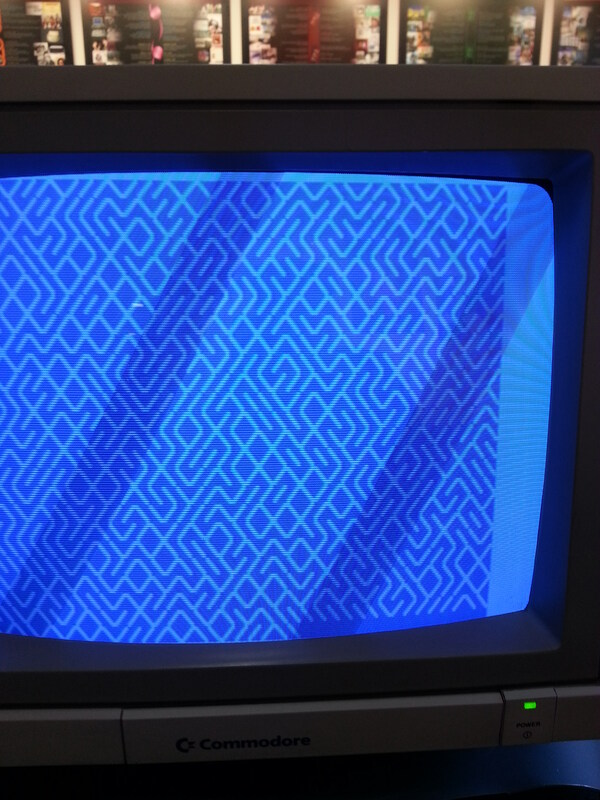 I’ve been to other computer museums and exhibits, and they’re mostly static. The Living Computer Museum may be the only museum in the world where all the computers — and the history — are living. 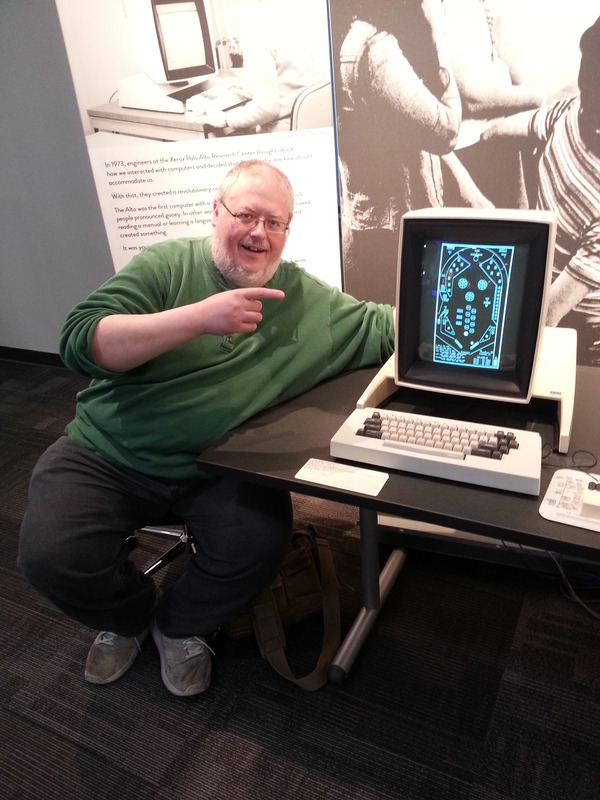 And now, a couple of bonus retrocomputing photos. This photo was taken by my friend Gerry, a stalwart member of our Finnegans Wake reading group (as is John). 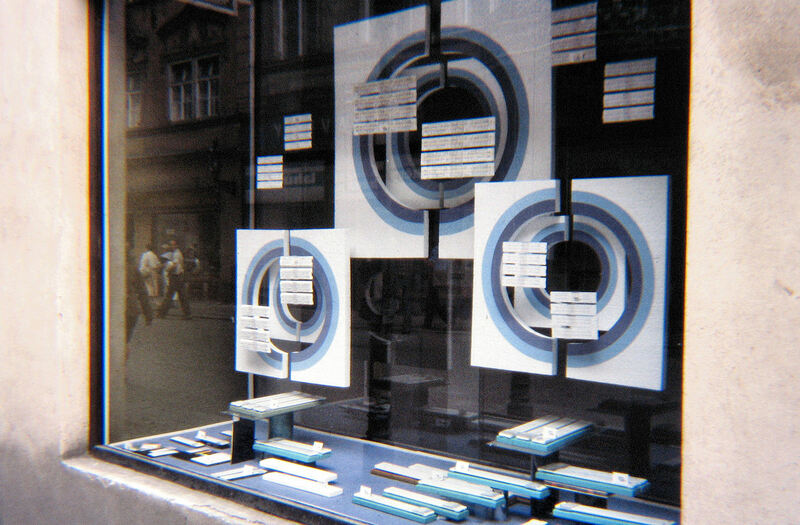 Why was a shop displaying slide rules in such profusion? Were they actually selling them, or was it conceptual art? Electronic calculators hit the West in the early 1970s; were parts of the Eastern Bloc still using slide rules as late as 1979? Perhaps I’ll drop a line to the slide rule mailing list. This is the facade of the Unicomp building in Lexington, Kentucky. Unicomp makes the marvelous Model M keyboard on which I’m typing this post, and which I’ve mentioned here before. My sister-in-law Melinda and her husband Keith live a couple of blocks from the Unicomp factory, and when they read about my Model M obsession, they offered to shoot the front of the plant for me. 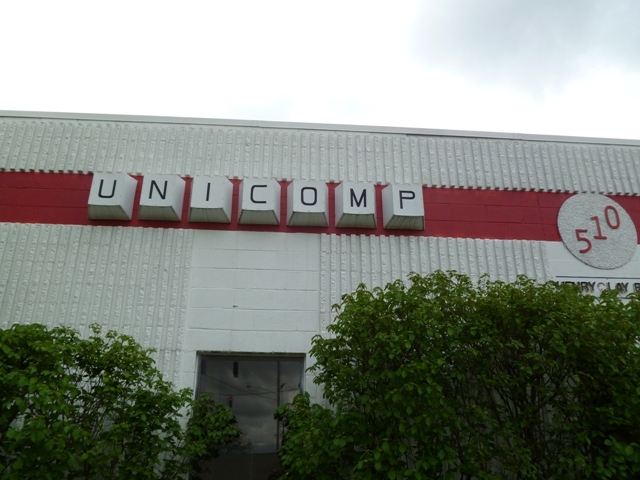 Notice the kitsch keyboard keys spelling out UNICOMP. They look different from the ones on their web page, so I’m guessing the former predate the latter, as web pages are easy to change, buildings not so much. We have now reached the end of the tour. Tip. Thank you for making a simple blog post very happy. Share and Enjoy! The following is an outtake from the book I’m currently writing, The Best of Games.fun: Reviews, State-of-the-Articles, and Other Information to Get You Through Your Gaming Day on Planet Glob. Glob (pronounced “globe”) is a parallel Earth very like ours, but whose people are more neotenous, and therefore more curious, more neophilic, and more playful than the humans on our planet. They love games, especially new and novel ones. The book is essentially design fiction, specifically game design fiction, with each chapter of 50 being a 1000-word “review” of an original imaginary game. That is, I’m making the games up, not writing about games other people have already devised, such as Calvinball or Quidditch. It has proven offensive to some people in workshops, who don’t understand I’m satirizing the DSM, the main psychiatric diagnostic manual in the United States, not people who are mentally ill. No other entry in the book has proven this offensive to anyone else, nor do I wish any to. My sister Pamela, who is a psychotherapist, has told me that therapists in training really do play a version of this game in grad school. The National Institute for Mental Health announced a few days ago that they’re ditching the DSM and starting over, just as the DSM-V is about to be published, too. Mocking the DSM is now shooting a dead horse in a barrel. I hope that my book’s loss in word count is your gain, enabling you to read this would-be excerpt well ahead of the book’s publication and get an idea of what I’m aiming at. It’s not all about psychiatry. There are four-dimensional video game systems, roleplaying games based on thought experiments, game design reality shows, and more. In this party game, one player picks a random disorder out of the official psychiatric handbook Diagnostic and Statistical Manual of Mental Disorders (currently in its DSM-VIII edition), pretends to have the disorder, and tries to convey it in conversation to teammates, who are supposed to be a panel of psychiatrists who must “diagnose” the player during a timed game round. The patient must vehemently deny she has the illness, but the psychiatric panel gets one final crack at diagnosing the disorder at the end of the round, during which the patient must tell the truth. All else being equal, at the end of the game, the team with the most correct diagnoses wins the game. A word about safety: whether this is sensationalistic or not, you can decide, but the game comes with a warning in large, nasty letters on the side: WARNING! DO NOT PLAY IN OR NEAR MENTAL HOSPITALS! The back of the box claims that unspecified persons have, while playing the game in the presence of psychiatrists, been mistakenly diagnosed as having the disorder they were only pretending to have, and been institutionalized. In the 1973 Rosenhan experiment, psychologist David Rosenhan and eight healthy confederates, or “pseudopatients,” made appointments at mental hospitals, claiming to hear voices saying variously, “empty,” “hollow,” or “thud,” but displaying no other symptoms. All of them were admitted and diagnosed with psychoses, mostly schizophrenia. Their average stay in the hospital was 19 days, with the longest being 52 days. Nevertheless, DSM-C plays mental illness for laughs. In fact, one of the diagnostic categories on the game’s cards is “pseudopatient.” If you draw this card, you will find yourself in the bizarre (simulated) existential position of having to convince your teammates that you are only pretending to have a mental illness you are only pretending to have. Depending on the difficulty of the disorder you are simulating as a pseudopatient (bipolar, paranoid schizophrenic, catatonic, etc. ), if you get this across, you may score anywhere from double points to an automatic win. At a recent game night, my friend Jim was pretending to have a mysterious disorder for the benefit of his “psychiatric board,” his teammates me, my wife Lonnie, and our friend Tim. Lonnie and her sister Lois were regretfully (jeeringly) placed on opposite teams; they are never allowed on the same team during word or party games, because they know each other far too well. The other side is permitted to ask questions they hope will lead the diagnosis in the wrong direction, except for opposing team members the patient has enlisted as actors in his own charade–obviously, it would be hard to use your own “psychiatrists” as “family members” and so on–so, a nice touch by the game authors, I thought. Jim had brought Lois into this scenario as his child. He felt her forehead and asked “Honey,” (we all snickered; Jim is past child-rearing age and has never addressed anyone as “honey” in our company), “would you like something to drink?” Lois nodded yes, so Jim went off to our host Anton’s kitchen, where another guest had left a rack of soft drinks. Suddenly, there was a crash, and a couple of players leapt up. “Jim? Are you OK?” I called. “I’m fine. I’m just getting some soda. Don’t mind me,” he said. More crashes. Breaking glass? “Well, we’d better get you to the hospital then.” And so Jim did, where he protested at great length that he wasn’t the “sick one,” his daughter was. The timer went off, but we had seen enough. In short order, the psychiatric board came to the conclusion that Jim was suffering from Münchausen syndrome by proxy, and poisoning his daughter in an attempt to get attention. (Two of us had also just seen The Sixth Sense.) Jim told us we were correct, so our team scored one point, and we kept the card with the diagnosis on it to track our score (otherwise, it would have gone to our opponents). It may seem simple enough (and it is fun), especially if you’ve had any psychological training, but I’ve been told by friends who are psychiatric residents that at truly high levels of play, the game can become not only riotously funny, but also eerie, even scary. Ah, but they’re violating the warning: DO NOT PLAY IN OR NEAR MENTAL HOSPITALS! 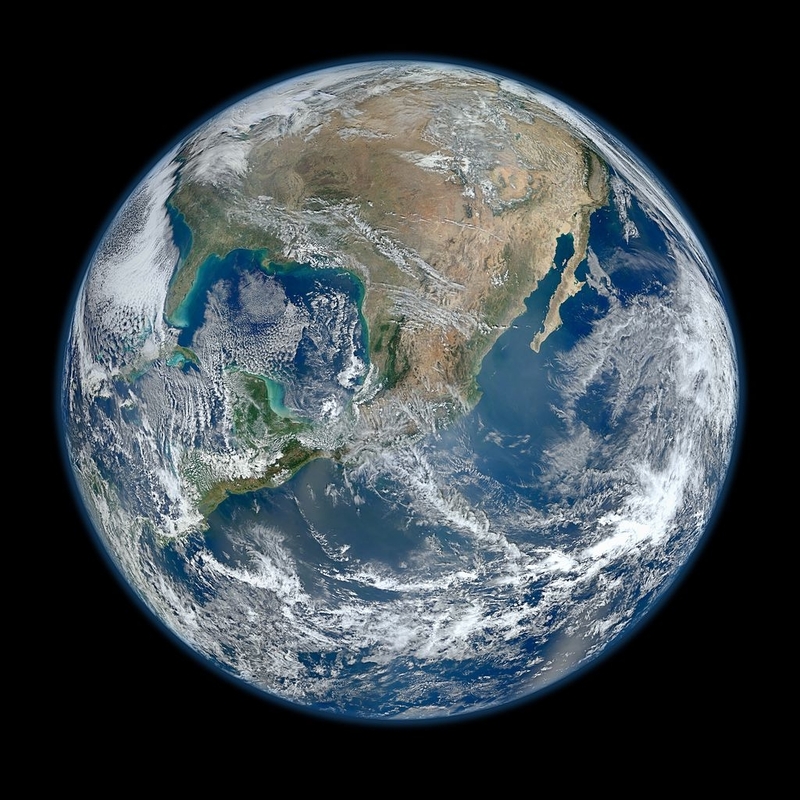 7 July 2013: Note that the planet Glob has been renamed to Loka. 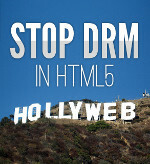 I hate DRM. It prevents you from copying things, and copying things is almost always good, unless you’re a polio virus. I want to be able to copy my own files legally from device to device, especially as the media age, and I want to be able to share files legally, especially ebooks, with my friends. One reason I’m pleased that geek institution O’Reilly Media publishes Mind Performance Hacks is that their books are sold without DRM. O’Reilly is also celebrating the Day Against DRM, and MPH is one of many O’Reilly books on sale for 50% off or more today, making it a good day to buy a DRM-free ebook. One more thing: You might also want to look at MPH’s lesser-known companion volume, Mindhacker. It’s from another publisher, Wiley, and the ebook version does have DRM — we can’t do anything about that — but we think it’s as good in its own way as Mind Performance Hacks. p.s. I guess in my haste to post this by midnight of the Day, I forgot to clarify how important it is to me that my readers are able to share my books too. Period.